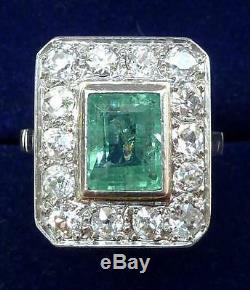 Superb platinum art deco 1.50ct Emerald and Diamond cluster ring. This superb platinum antique ring originates from the 1930's. Inticing the viewer is a gorgeous 1.50ct natural Emerald. Measuring 8mmx6mm this has a fabulous green colouring and offers an unmissable show alone. The Emerald is accompanied with fourteen matching european old cut diamonds. Totaling approximately 1ct these have a real vigour to their flash and offer the perfect compliment to their Emerald. The shank is solid platinum and the ring is in excellent condition commensurate to its age. A fabulous antique that makes a wonderful statement when worn, this ring is sure to turn heads. Dimensions ring size H Finger length 17mm. Pay pal postal orders bank transfer and cheques are accepted. Cheques and bank transfer would be appreciated on higher priced items. Most international items will take 10-14 days to reach their destinations. All items are honestly described with decades of experience in the antiques trade. Create listings that get noticed! With Auctiva's 1,800+ Templates. The item "Superb platinum art deco 1.50ct Emerald and Diamond cluster ring" is in sale since Saturday, January 7, 2017. This item is in the category "Jewellery & Watches\Vintage & Antique Jewellery\Vintage Fine Jewellery\Art Deco (1915-1935)". The seller is "adlantiques" and is located in London.